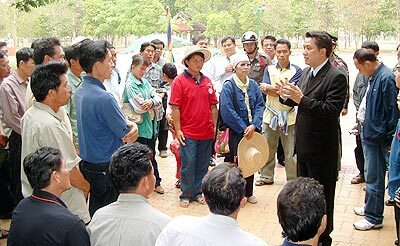 The Secretary General to the Minister of Commerce, Arisman Pongruangrong, right, meets with protest representatives in a failed attempt to negotiate a better price for their crops. More than 700 farmers and garlic growers from five local districts protested in front of City Hall recently, following a refusal by the Secretary General to the Minister of Commerce, Arisman Pongruangrong, to help negotiate a better price for their crops. During the three day protest, 500 members of the security forces, police and special task force units were deployed at the scene. On the third day, April 10, Arisman finally met with representatives of the protestors and with Natniti Wuthithammapanya, the head of the network of growers. The meeting, however, only lasted 30 minutes, and ended with the growers’ representatives walking out. When it was announced that the meeting had failed, it was decided to mount a petition with signatures from all the protestors, and to present it to higher government decision-making authorities. Arisman later stated that the government had offered two solutions to the growers, firstly that the superstore Big C would purchase the entire crop, and secondly that processing factories and retailers would purchase it. The two offers, he said, would expire on April 21. Both the offers were refused by the growers, who considered that the price was too low. The present wholesale price is 14 baht per kilo; growers state that they need a government guarantee of at least 25 baht per kilo in order not to make a loss on their investment and labour. Growers in the area produce at least 100 million kilos of garlic each year. The protesters at the Chiang Mai City Hall last week. A raid on a small opium plantation in Pha Bong district, Mae Hong Son, was carried out on April 11 by local defence volunteers, forestry officials and police officers, and was attended by the Deputy Governor of Mae Hong Son, Wanchai Suthiwongchai. On their arrival at the 50 square wa field, which was concealed in a banana plantation, a man was observed running into nearby woods. The opium poppies were destroyed rapidly, as it was felt that there might be a risk of attack from the growers. A small hut containing a gun, opium consumption tools and food was also destroyed, and its contents confiscated. As the opium field had been encroaching on the forest, the landowner is being sought by local police. by well-wishers upon his arrival at Chiang Mai Airport. Ex-Premier Thaksin Shinawatra, arrived in the city of his birth, Chiang Mai ,on the afternoon of Friday, April 11. His first visit was to Wat Phra Sing to pay his respects to the most revered Buddha Sihing image before the start of the Songkran Festival. Thaksin had already begun what he referred to as a “merit-making” tour to his key rural stronghold, Northern Thailand, but has refused to make any comment on politics. It was Thaksin’s first trip outside Bangkok since the end of his self-imposed exile in Britain after he was toppled in a military coup in September 2006. Speaking recently he said that he wanted to visit the region only to perform Buddhist merit-making ceremonies, and to visit Cambodia during April 5-6 to play golf with Cambodian Prime Minister Hun Sen. He has recently stated that he only wants to make a “social contribution” to his country. Police were called to a 7-Eleven store on Changklan Road near Wachirawit Junior School on April 11 following a robbery in which the sum of 5,000 baht and two bottles of Black Label scotch were stolen. Tawipob Chintrakul, 16, an employee at the store, reported that a man, having waited until there were no customers in the store, came in brandishing a gun and forced them to give him the contents of one of the tills, some 5,000 baht. He then ordered Tawipob and a female employee to lie on the floor, took the two bottles of scotch from the shelf, and was seen to fire a shot in the direction of the cupboard under the shelf. After shooting, he ran from the store and fled, using a black Honda Dream to make his escape. Tawipob, having realised that he had not actually heard a shot, checked the shelf for damage and bullets. Finding none, he became certain that the gun had been a replica. The police were immediately informed and road blocks were set up, but the thief has not as yet been traced. Police later stated that, as the robber had seemed very well informed as to how much cash was in the till, it was possible that he could have been a former employee. The gun used may have been a compressed air gun, which the robber had fired in order to let the employees know that he had tricked them. A search was made of restaurants, bars, and entertainment venues to check whether the robber had been seen carrying the two bottles of scotch, or had been making attempts to sell them in the immediate locality. A description of the man given by both the employees matched up with CCTV footage of the robbery. The recent excessively high temperatures of over 40 degrees Celsius in Mae Hong Son resulted in both locals and visitors cooling off by swimming in the Pai river and sheltering from the fierce sun under sheds provided along the river’s banks by the local authority. As a result, far fewer people remained in the town itself to celebrate Songkran by throwing water, a positive development considering the present problems with lack of water in the province. The drought has resulted in the traditional Songkran festival being held in the town on only one day, April 15, instead of the usual April 11- 16 dates. The parade of the sacred Buddha images took place as usual, however, and locals and visitors alike sprinkled holy water on the images and prayed for luck and prosperity in the New Year. The Mae Hong Son Meteorological Station has warned of expected summer storms in the area, including severe hailstorms, and has advised residents to make sure their properties are secure. Warnings were also given about the dangers of the spread of diseases such as food poisoning, dysentery and typhoid fever in the abnormally high temperatures, and the public are being asked to be careful with food hygiene and drink only clean water. A religious ceremony was held at the Phaya (King) Mangrai Shrine on Ratchadamnern Road on April 12, Phaya (King) Mangrai day, to commemorate the founding of the city 712 years ago by the great King Mangrai. The ceremony was presided over by Dr. Mom Chao Duangduen na Chiengmai, the president of Chiang Mai Culture Council, and was attended by officials from the city’s organizations and public people. 1. 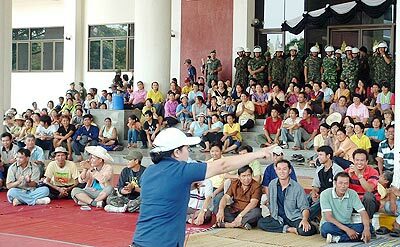 The King Mangrai Royal Family palace, so-called “Khum Lang”, had been used as a women’s prison today; should be removed, and then this former royal palace should be renovated and restored, and will become the improvement of a “City Gate” grounds, a new green recreation area to be in which events and activities will be staged. 2. Concern has been raised about the extension to Chiang Mai International Airport, citing possible property damage, noise pollution and damage to health; the airport should therefore be relocated at a far distance from the city itself. 3. At present the Bangkok-Chiang Mai rail service runs on a single track for some distance; the track should be upgraded to a double track. 4. Improvements should be made to Chiang Mai’s public transportation (mass transit) system in the city in order to reduce private car usage, and to decrease traffic jams in the city. 6. By modifying both sides of the River Ping and the city moat, city walls and increasing the green areas around the sidewalks, the green zone in the city will be increased, and its historical significance will be enhanced as well as landscaping along the Ping river banks. 7. To restore and rebuild the ancient city walls, and to reduce the surrounding commercial areas, increasing the public access areas and using buildings for education, culture and as museums. 8. Temple sites should be used as models for preservation of the city’s Buddhist heritage, and not as parking lots. The Buddhist Dharma as preached in the temples should be stressed as a way to avoid attachment to material things. Hotels and shops should not be constructed in proximity to temples. 9. Sidewalks should be used for walking in the shade, not as a place for selling goods. 10. The local administration should collect and properly deal with rubbish from properties in the city, and, when suitable, should arrange for its conversion to methane gas to be used in the production of electricity. 11. A renovation project for the Inthakil Temple should proceed, thus allowing worshippers to use the temple for their devotions. There should be no parking allowed, nor any roads dividing the temple area. 12. The Chiang Mai-Lampang road area in front of the Jed Yod Temple should be renovated and kept as a green area in time for the 600th Anniversary in 2009 of Phraya Tilokarat, the great 15th century King of Lanna. 13. Laws should be strictly upheld, alcohol should not be sold during Songkran, residents and visitors should dress correctly, respect traditions, celebrate safely and not throw water from vehicles. 14. To protect the city of Chiang Mai from following Bangkok’s infatuation with extravagance, inappropriate construction and “concrete fever”. A report regarding illegal immigrants received on April 11 by the immigration authorities at Fang District, Chiang Mai, resulted in a checkpoint being set up at Ban Muangrae, Tambon Maeka. A white Hino truck with canvas covering the rear was stopped, and four illegal Burmese immigrants were found to be hiding under the cover. Jaiting Teewang, 28, Thuan Lungmool, 30, Naiklam Lungyad, 25 and Suay Lungthai, 31, were not able to present passports, and later told police that they had intended to seek work in the Pasang district of Lamphun province, and had hired the driver, Charoen Chinayan, to transport them from Chiang Rai to their destination. Charoen was arrested, together with the four Burmese, who were charged with illegally entering the Kingdom. Thailand, Singapore, Japan, Indonesia, and the United States today announced their participation in the Cobra Gold exercise to be held in Thailand from May 8-21. Cobra Gold is a regularly scheduled joint and combined multi-national exercise hosted annually by the Kingdom of Thailand. This year’s is the latest in a continuing series of exercises designed to promote regional peace and security, and marks the 27th anniversary of this regionally significant training event. The U.S. Embassy Bangkok’s Deputy Chief of Mission James F. Entwistle said at the CG08 press conference that “multi-national responses to regional crises are likely to be the norm in the future; in order to better address tomorrow’s requirements, it is vital that friends train together. There is no better exercise than Cobra Gold in keeping our militaries ready to respond to the real-world priorities of supporting peace, stability, reconstruction, and humanitarian assistance.” Training will consist of a computer-simulated command post exercise, field training exercises, and humanitarian/civic assistance projects. In addition to the five main participating countries, the Thai government has invited several other nations to participate in various roles during the exercise. The following countries have been invited: Australia, Brunei, France, Italy, United Kingdom, Bangladesh, India, Malaysia, the Philippines and Mongolia. A violent but thankfully brief storm hit the Chiang Rai area on the evening of April 13, disrupting Songkran celebrations and blowing down the Tourist Office’s tent, leaving officials frantically scrabbling for cover. Many trees were uprooted, some blocking roads, and advertising hoardings along the roadsides were destroyed. Because of the brief duration, about 10 minutes, of the storm, no serious damage was reported, although inspections are continuing. Warnings were given that in present weather conditions, similar storms may well occur at any time. A Buddhist religious ceremony was held last week at Sukhito House, Chiang Mai, to worship the Phra Chao Lanna Pitchitmarn Buddha image, portrayed with hands in the “fighting against enemies” mudra. Offerings made at the ceremony were later placed in a spirit house near the Huay Tung Tao reservoir. A ceremony requesting forgiveness for past misdeeds also took place, symbolically using an offering of 6 cows in the traditional manner, whose lives would be spared through prayer and worshipping. The ceremonies were conducted by the “Designated Astrologer of the Council of National Security”, Warin Buawiratlert, a famous shaman, and attended by over 100 officials and worshippers. Amongst them were four present and previous holders of high governmental office. One such, Gen Chalit Pukpasuk, said when asked that his motivation for attending the ceremony was to make merit; this was not linked in any way to politics. He maintained that he is a devout Buddhist, and that no ulterior motives were involved, and stated that the Lanna Pitichitmarn Buddha belonged to all Thai peoples, and all should be able to attend it to make merit without criticism. He also said that all Thais should make merit regularly to support Buddhism to ensure their own and Thailand’s prosperity, and that, now he is older, he needed to make merit more frequently. The ceremony was also attended by a large number of media representatives, who asked whether the merit making could be taken as sign that a change was coming on the political scene. Chalit replied that people should remain calm, as “some things take time”. To the groups of volunteers present, he said that all should proceed towards the achievements the country is waiting for, and added that politicians should also concentrate on doing good for their country. Then, he said, the results should be apparent very soon. When asked about the possible amendment to the 50th Constitution, he replied that all depended on the environment and finding an appropriate situation. It could be done, he stated, “but if it is done, the people will have the last word”. Warin Buawiratlert also spoke about the ceremony, saying that the making of merit was connected to the long life ceremony directed for Thailand as a state, and had nothing to do with politics. He performs, he said, the same ceremony each April, July and November, and has done so for the last ten years. As regards a statement which was made referring to political reform and separatism, he considered that it had been made in a cooperative manner for the country as a whole. Absolution of the sins of the entire country was an aim of the ceremony, which would benefit the entire nation. In response to questions about his supposedly upcoming predictions for the Prime Minister, Warin stated that he neither knew the PM, nor knew his birth date, which is necessary for an accurate prediction. He assured his questioners that the recent return of ex PM Thaksin Shinawatra should not be a cause for concern, and does not see an opportunity of meeting with Thaksin, who has not been in contact with him. During the ceremonies, a group from the Khon Rak Chiang Mai political party picketed outside the property, protesting and holding banners exhorting Warin to stop criticising the present government. Rescue workers and medical emergency staff are working round the clock as celebrants of Songkran, Thailand’s traditional New Year water festival, begin returning to the capital city after a long holiday weekend, according to Health Minister Chaiya Sasomsup. Chaiya, also deputy director of the national Road Safety Center, said roads leading to Bangkok are expected to become busy later Tuesday and Wednesday as Songkran revellers start returning for work. The RSC have asked police to take action against drivers who speed as well as those who drink alcohol, and highway police have opened additional lanes to allow larger numbers of vehicles to head for Bangkok. According to Chaiya, in the first four days of the “seven most dangerous days” during Songkran, beginning April 11, there have been 2,949 road accidents throughout Thailand, with a tally so far of 229 deaths and 3,315 injuries. The northern provinces of Phetchabun and Phitsanulok had the highest road death tolls during the four-day period with 11 and 10 fatalities respectively. Drink driving was the major cause of road accidents during the period, and four out of five accidents - 81.26 per cent - involved motorcycles. During the past four days, according to Chaiya, rescue workers and medical staff have responded to 5,222 road injuries, 4,639 sudden illnesses, 73 attempted suicides, 48 drowning incidents and intervened in 846 quarrels. Anucha Mokkhavesa, director-general of the Disaster Prevention and Mitigation Department, said provincial authorities had been told to take special action against drunken motorcyclists who also don’t wear helmets, because they were the ones who caused most accidents. Another fatal accident involving a bus occurred recently on a hill on the Chiang Dao area. On April 9, a Daothong Transport Co.’s bus, travelling from Chiang Dao to Wiang Haeng and containing 30 passengers, ran off the road whilst trying to accelerate into a switchback curve on a mountain road. Police were called, and found the bus on its side, with many passengers injured and two dead. The injured driver, Wong Donjorhon, 50, stated to police that the bus had lost power when he tried to accelerate round the curve, and that there was no response from the engine when he changed gears and disengaged the brake. He lost control of the vehicle, causing it to roll backwards, collide with the guard rail and nearby trees, and finally flip over. One passenger, Sangthoon Saithoon, died on the way to hospital; the bus boy, Samphan Thonksaek, was found dead at the scene. All the passengers were transferred to Chiang Dao Hospital, where those who had sustained minor injuries were treated before being sent home. The 14 passengers with more serious injuries, including the driver of the bus, were admitted to the hospital.